Use this pre-built directory to find the highly qualified medical professionals constantly working to help patients in Canada: nurse practitioners. This list contains all of the information you need to network and connect, from emails to phone numbers to names to addresses. Find Canadian nurse practitioners easily with the help of this pre-built directory from Bookyourdata.com. Nurse practitioners (or NPs) are a highly educated, advanced, and experienced group of nurses who have the ability to treat chronic conditions and acute illnesses. They help a wide variety of patients across Canada, extending the reach of physicians to a wider group by being able to serve those with smaller and more persistent health problems. They often recommend medications and regimens and provide many different kinds of care. These are high-level nurses who have a wide influence in many communities in Canada. If you want to market medical supplies, pharmaceuticals, and other innovative products to a list of nurse practitioners who often have a large influence, then use this contact directory to get a hold of them. 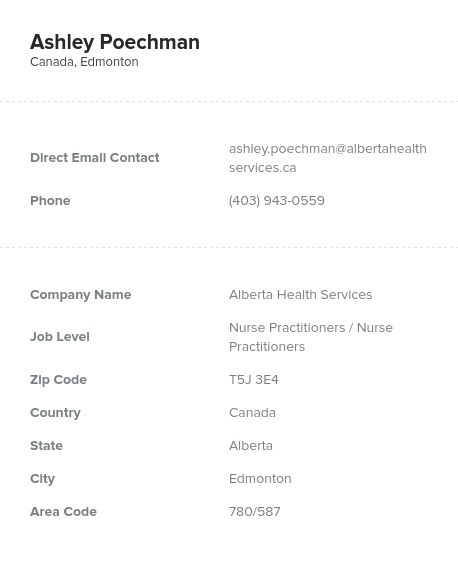 The emails, phone numbers, and variety of contact information you find on this list will enable you to network with and market to specifically nurse practitioners in Canada, allowing you to get in touch with your specific target audience. Get this pre-built, accurate, affordable directory today. You can pull this list into your CRM easily and get started quickly without having to pay extra fees. Download our list of Canadian NPs today!